Pregnancy pillow were first established for the comfort of pregnant women. Now a day millions of pregnancy pillow are said to provide what all pregnant mother look for 'comfort'. They are ideal for woman that suffer from sleeping problems, back pain, discomfort, cramps, and muscle pain.Sleeping comfortably at night while pregnant is never easy unless you find that one pillow that gives you comfort. 'Comfort' is what any pregnant mother needs if you are buying a pregnancy pillow for the first time. But you don't need to look any further because Mumanu Pregnancy Pillow describes comfort once you give it a try! The Original Mumanu Pregnancy Pillow is more comfortable and especially designed to quickly ease hip and lower back ache, plus it also helps to take the pressure off your bladder and helps to stop you twisting by keeping your hip, knee and foot at the same height. 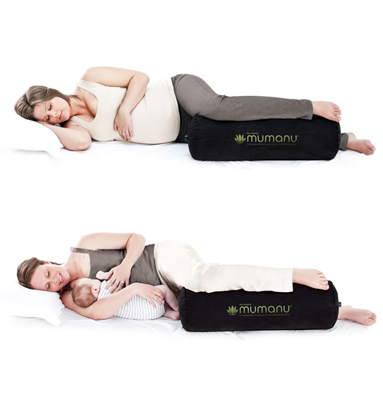 You can position the Mumanu to help with comfort during breastfeeding and snuggle time. The Mumanu has been especially designed by a specialist in pregnancy and post natal massage and tested on over 1500 women. Get comfortable with Mumanu Pregnancy Pillow!